Seeing step by step on how to apply eye shadow can help tremendously. As you view these images, keep in mind that these application techniques will work for any eyeshadow shades you want to use, including darker shades for smoky eyes, and metallic shades for a bright, sunny look. Step one in the applying eye shadow process is to use an eye cream, if applicable, to smooth out fine lines around your eyes. You'll want to apply this cream first before you begin working with color. Once your eye cream has settled (typically that takes about three to five minutes), it's time to apply your concealer. You can use the pad of your finger to apply the concealer, but a concealer brush provides a greater amount of control. This allows you to expertly apply the concealer in those hard to reach places, for example, the inner corners of the eye. The base color is the one that is the lightest in your eyeshadow duo, trio or quad, and it is applied over the entire lid. Note that if you prefer an eye primer, you may not need a base color. Additionally, there are now many primers that serve as a base color, so the added step of applying a lighter color over the primer may not be necessary. If you are planning to wear eyeliner, now is the time to apply it. Using a sharp, but soft pencil, pull the eye out slightly at its corner with one hand, while applying the eyeliner with the opposite hand. Now you are ready to apply color. 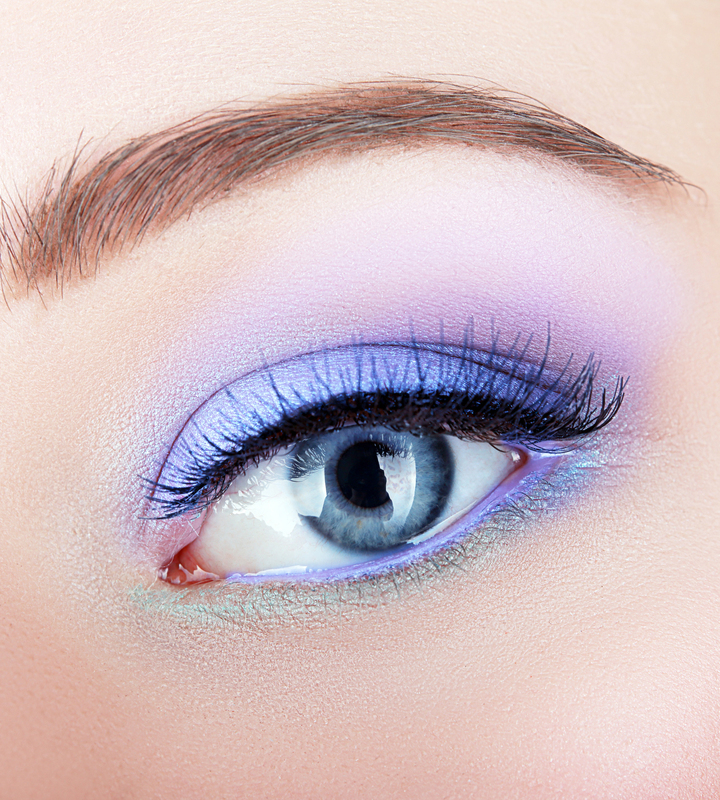 Using an eyeshadow brush, apply a deeper shade of color up to the crease of the eye. Highlighter shades are applied underneath the brow bone. Apply this shade carefully, right under the brow. After all of the color you are using has been applied, finish up the eye with a few coats of mascara. If you'd like, you can also apply mascara to your lower lashes as well. Here is a close up of the finished eye. Note that all of the layers are distinctive, so you can see the mascara, eyeliner, color and base shadow clearly and beautifully. See even more eye shadow colors in the eye shadow pictures slideshow.